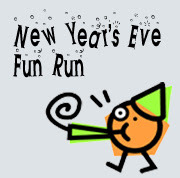 We've posted about this a while ago, but now that New Year's is upon us: the 2007-2008 New Years Fun Run will be happening tomorrow night (12/31) at 11:15PM Prospect Park. The start and finish line of the 3.3 mile race is the park's Grand Army Plaza entrance. It's sponsored by the Brooklyn Road Runners Club and Slope Sports and the entry fees are as follows: $15 for Brooklyn Road Runners Club members and $20 for non-members before December 30. (We're not clear if today counts or not, so check with the sponsors.) Race Day registration is $20 for members and $25 for non-members. One can register or pick up numbers at Slope Sports, which is at 70 Seventh Avenue, between Lincoln & Berkeley, in Park Slope. The telephone number is 718-230-4686. Registration hours are: Sun. Dec. 30th, 12PM-5PM, Race Day, Mon., Dec 31st, 11AM-5PM. There is also on-site registration from 10:30PM-11:00PM on New Year's Eve. All the info is at the Slope Sports site. Louise Crawford of OTBKB is thinking about running in the race, and has also posted info about it. Give her a wave and a big thank you for all the great work she's done this year if you see her.